Perperikon is located in the East Rhodope Mountain, 20 km northeast from the town of Kardzhali. The rock city stands on a cliff top at a height of 470 meters. The village of Gorna krepost lies at its foot, and the river Perpereshka flows beside it. The comfortable river valley has created conditions of life since ancient times. 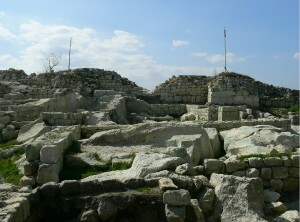 Therefore the valley is strewn with dozens of archaeological sites from various ages, the center of which is Perperikon. The medieval archaeological complex Perperikon is one of the most ancient monumental megalithic structures, entirely carved into the rocks. It is one of the most popular tourist destinations in Bulgaria. Human activity in the area dates back to 5000 B.C. The first traces of civilization on the hill date from the Bronze Age, while the ceramics found on the place date from the Early Iron Age, as well as the impressive round altar, almost 2 m in diameter, hewn out of the rocks. Religious activity at the top of the cliff began in the 5th century BC. It is associated with the beliefs of the Copper Age people, who started the cult of the sun god. Here they established the first sanctuary and started leaving food containers for the gods. These religious rites continued through the entire Bronze Age (III-II millennium BC). The sophistication of the metal tools made the hard rock cutting possible. At that time the oval hall with a huge circular altar in its center was built. There, priests performed their sacred rituals with wine and fire. These religious practices were typical for the temple of Dionysius, which was long sought in the Rhodope mountain. 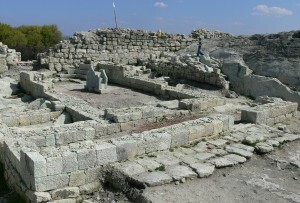 The latest archaeological research show clearly that the temple was located exactly in Perperikon. According to the legends, two crucial prophecies were made from the altar of this temple. The first one predicted great conquest and glory for Alexander the Macedonian, and the second, made a several centuries later, predetermined the power and strength for the first Roman Emperor – Gaius Julius Caesar Augustus. In the last millennium of the old era and the first centuries of the new one, the rock structures grew and became a town with fortified walls, palaces and suburbs. The town was probably a royal residence for the Thracian tribe Bessie. Subsequently the Romans brought to Perperikon their luxury and refinement, and the Goths ruined and burned down Perperikon in 378 AD. In the beginning of the 5th century AD the rock town became an Episcopal center after the people in the Rhodope mountains accepted Christianity. In the 7th-14th century AD Perperikon flourished as a regional center. Many times Bulgarians and Byzantines fought for these lands. In the end of the 14th century the Ottoman Turks conquered and destroyed the fortress, the ruins of which slowly sank into oblivion. Today the ancient glory of Perperikon rises. The holy city is unique in terms of archaeological, historical, environmental and multi-religious aspect – it is one of the World’s Wonders. Many of the artifacts, discovered during archaeological explorations of Perperikon, can be seen in the History Museum in Kardzhali. It can be reached by a well-maintained asphalted road, and there is a parking lot at the foot of the hill.